Early this morning, the Fed released its latest monetary policy update. The statement still contained the all-important phrase ‘considerable time‘ in reference to the schedule for interest rate rises following the termination of QE. But the ascending dots were what sent a jolt through markets. 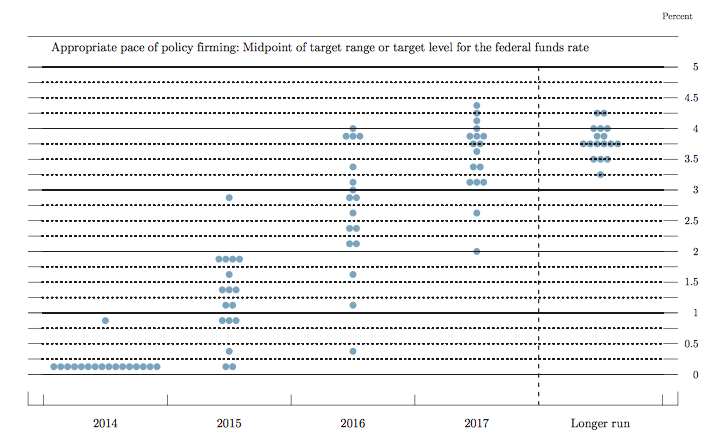 The average view within the Fed is now that the official interest rate will reach 1.375% by the end of 2015, as opposed to 1.125%, which was the expectation in the June meeting. This means a quicker pace of interest rate rises, even if the timing of the first hike is expected to be roughly the same (not for a considerable time, if we’re being precise). Evidence based on surveys, market expectations, and model estimates show that the public seems to expect a more accommodative policy than Federal Open Market Committee participants. While this one from the economists in Washington argued that much of the decline in the labour force participation rate is structural in nature. The implication being that we will not necessarily require higher employment-to-population ratios to see wage-pressures start to appear. Thees papers helped set the US dollar alight, with the DXY now well-poised for a break-out following the Fed releases. It rose against all the majors last night, but particularly against the yen. 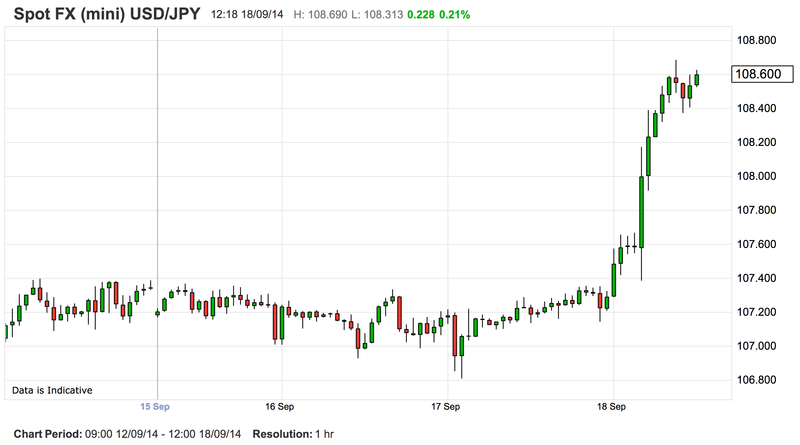 And so the USDJPY continues on it’s merry way. I wouldn’t usually put a great deal of importance on broken trends over very long timelines, there’s too much else that could be going on for technicals to take precedence. But there certainly looks to be a stark divergence emerging between the monetary settings of the US and Japan. Japan is suffering right now, but a large part of that is due to the sales tax hike in April, which saw a spike in sales immediately before, and a consequent slump afterwards. We’ll have to see how the rest of the year plays out, but if the government presses ahead with another planned hike next year, we can be sure it will heap more pressure on the yen. Many unknowns, but I wouldn’t be surprised to see the USDJPY come within striking distance of 120 by the end of next year, assuming the Fed’s rates schedule pans out as officials are expecting. It’s worth remembering that the behaviour of the dollar over the next few months could well be an important consideration for the Fed’s interest rate schedule. Disinflation remains a concern in the US (although the latest CPI was negative mainly on account of lower energy prices, and one trusts the Fed will not be worried about that). 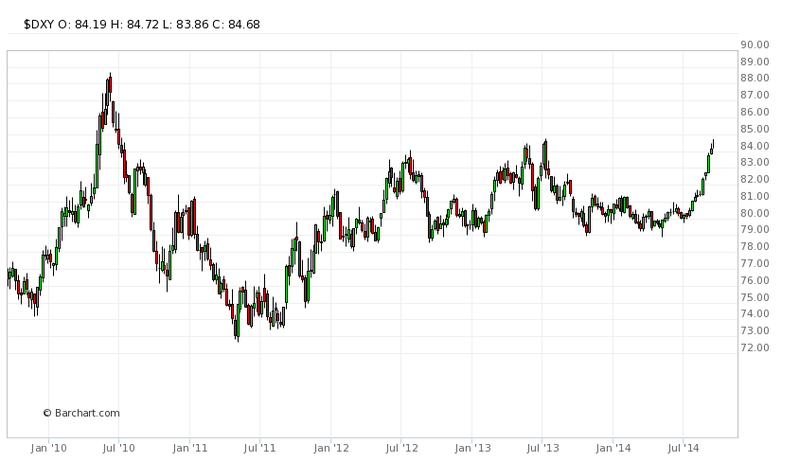 If the dollar stages a thumping rally over the next 6 months, it will further quash inflation and weigh on US exports. A strong dollar, should it take the steam out of domestic price pressures, could itself delay or flatten the planned rises in short term interest rates. As always when the USD starts to stir, it’ worth checking in on the barbarous relic, which is staring squarely into oblivion. 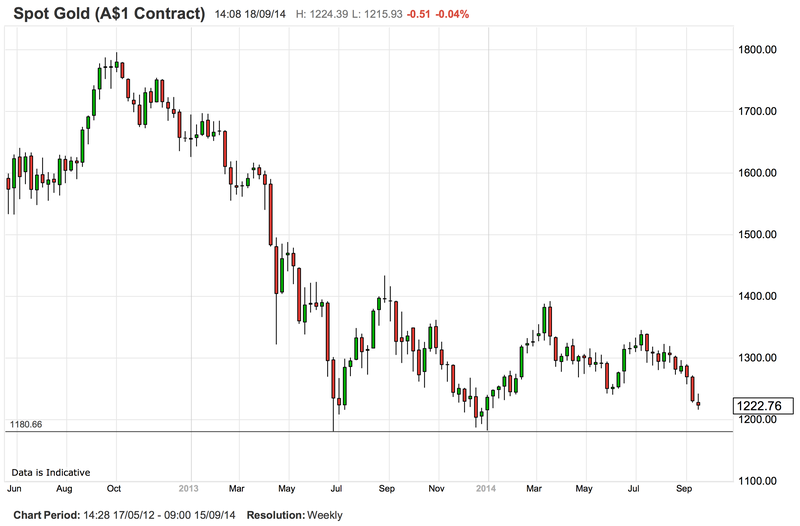 Not much further and we can kiss goodbye to critical support at $1180. It’s going to be a wild ride form there. 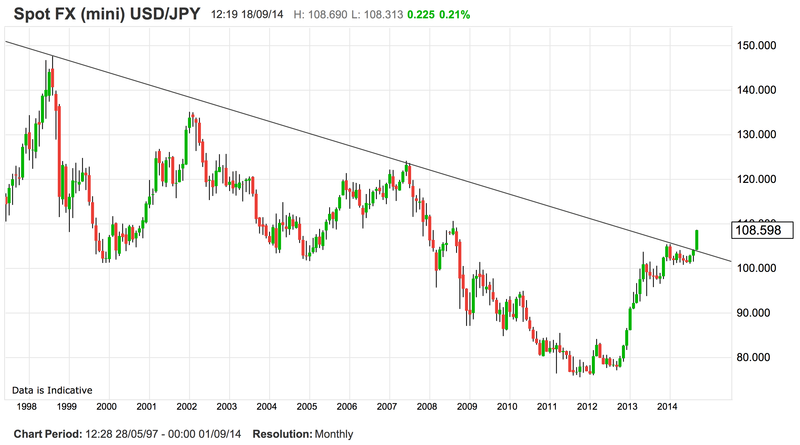 This entry was posted in Uncategorized and tagged Fed, interest rate, monetary policy, USDJPY on September 18, 2014 by MJV.